Walking with Jesus: Day 156: John 3:1-21 & Psalm 2 - What Does It Mean to be Born Again? Day 156: John 3:1-21 & Psalm 2 - What Does It Mean to be Born Again? Have you ever met a "born again" Christian? What image comes to mind when you hear that term? Do you picture a Bible-thumping kook? Have you ever met a Christian who isn't born again? Well, not if that person was truly a Christian, in truth and not just in name. Jesus told Nicodemus in clear and unambiguous terms that "unless one is born again, he cannot see the kingdom of God." But what did He mean? Many people have misunderstood what Jesus meant, even as Nicodemus did. Many pastors and preachers have misinterpreted and misapplied Jesus' message. First of all, Nicodemus' confusion and Jesus' response make it clear that Jesus was not talking about a physical rebirth. Obviously, a person cannot re-enter his mother's womb and be born for a second time. But some people still think of being born again as a physical process - maybe losing a bunch of weight or kicking a bad habit like smoking. These kinds of experiences sometimes leave people saying that they feel like they've been "born again." Jesus makes it clear that He's not talking about any kind of physical experience. Being born again is something which the Holy Spirit must do in the life of an individual. As Jesus said, "That which is born of the flesh is flesh, and that which is born of the Spirit is spirit." When we're born into this world, we are physically alive but spiritually dead. Paul describes this state of spiritual death in Ephesians 2:1-3. We may be breathing air, thinking rationally, making choices, experiencing emotions and even striving to be a "good person," but we are all born dead toward God. Because of the sinful choice of Adam and the natural consequence which has been passed down to all of his descendants in the human race, we are born cut off from the life of God, physically alive but spiritually dead. The only way for us to be spiritually alive is to be "born of the Spirit." In other words, the Holy Spirit has to give us life. Unless we have this life, we "cannot see the kingdom of God." We cannot see spiritual realities without spiritual eyes. We cannot perceive and enter into God's kingdom without God's Spirit first giving us life. Because Jesus later goes on to say, "the Son of Man be lifted up, that whoever believes in him may have eternal life," many people have taught that being born again and believing in Jesus are the same thing. But a closer look at Jesus' teaching can clear up this confusion: Being born again is required in order for a person to believe in Jesus, but it is not the same thing as believing in Jesus. 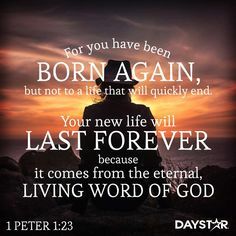 More importantly, it is not believing in Jesus which makes a person born again, but it is being born again which makes a person believe in Jesus. Spiritual life comes before saving faith, because "unless you are born again, you cannot see the kingdom of God," and you cannot believe until you can first see with spiritual eyes. If you believe in Jesus as the Son of God and your Savior and Lord, then praise God that you have been born again. Without being born again, saving faith is impossible. But for those who have been born again, saving faith is the first fruit of our spiritual life, and that spiritual life is eternal. We believe because we are spiritually alive, and because we are spiritually alive, we will never die. Praise God! and against Your Anointed, King Jesus. conspired together to try to rid themselves of King Jesus. The nations rage, the rulers plot, but it is all in vain. and His kingdom shall know no end. O Lord, let us worship and serve King Jesus. giving Him the honor He is due as our crucified and risen Lord and Savior. to King Jesus as Your children and servants forever! Day 152: John 1:1-18 & Psalm 148 - Who is Jesus?